This week at Mustang Maniac I had a mail to say it was cold and snowing randomly. I took the hint and packed some thermal clothes and drove to the yard. I emptied my boot and took more of the cleaned up parts to the car to see what I needed to do. Adam and Yogi had a conversation to see what was the best way forward and the general verdict was the under dash fittings. That was going to be the wiper actuator arms, wiper motor, hand brake lever and the drivers fresh air vent. I was also given a few grommets to seal some holes such as the fuel line and the gas pedal to the fire wall. The idea was to fit these parts before the main wire loom gets in place and in the way. The first job was the wiper actuator arms, these are stamped left and right for good reason as they have limitations to how far they will move. 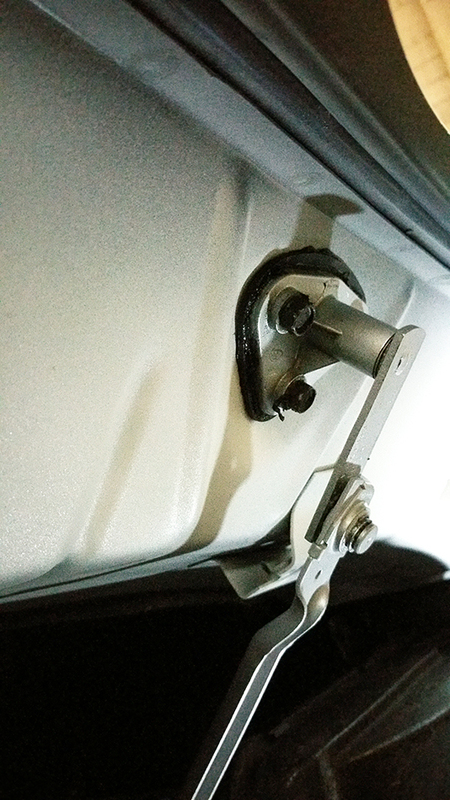 The ends of the arms have three bolt holes that will attach to the underside of the dash. The fittings also have a gasket to seal the water from the inside of the car. I reinforced this with some gasket sealer before I bolted it to the car. As this was a newly painted cowl I inserted the bolts into each fitting and made sure that the paint would not stop the bolts going into the holes. A small bead of gasket maker was applied to the rubber gasket and moved under the dash. The original gaskets were made out of leather believe it or not! The next trick here was to put the windscreen wiper arm lug through the hole without damaging the paint work. I started on the left side as that was the easiest access and out-of-the-way as a dry run for the more tricky drivers side. With the fitting in a rough position I inserted the bolts and took them up to finger tight. I tightened up the bolts in sequence until they were tight. The driver’s side was awkward to get to due to the brackets for the dash gauges, variations of wobble bars and spanners were needed to tighten up the bolts which is a lot easier without the wire loom in the way. Again a dry run with a bolt to clean the fittings. the same procedure of gasket maker was applied and gently located through the hole. As you may recall from a previous post last year my old two-speed wiper motor was involved in some sort of under dash fire resulting in all the wires burnt away before I got the car. A two speed replacement is pretty rare and I wasn’t able to track one down. The resolution was a new upgrade replacement from New Port Engineering. I created a post for the replacement of the wiper motor, click here for the quick link and I posted a YouTube video of it all working, click here for the video quick link. Anyway, same process to fit the wiper as before. The motor was already mounted on the bracket that has two bolts at the bottom and two at the top which are slot ins for the bracket. The most difficult part of the process is to fit the actuator rams onto the link pin from the new motor. this requires a lot of patience and little persuasion with a something small to tap the arms in place. I coated a generous layer of copper slip grease inside the arm holes and the pin. The final step is to clip the “e-clip” to the top of the pin to stop the arms lifting of. That will test the patience of a saint. Feeling pretty pleased with myself I moved to the fresh air vent on the drivers side. this is a case of three bolts attached to the underside of the cowl. A gasket sits on top of the vent to stop draughts. The control wire for the vent runs under the dash and to a bracket. This bracket sits on the visible side of the dash, and the bolt holes are on the end of the hand brake lever. After I fitted the air vent the hand brake or emergency brake needs to be fitted. The two bolts at the bottom go through the fire wall and the wire through the hole next to it filled with a rubber pipe to seal the hole. The top of the hand brake is on the inside of the dash and the air vent bracket bolts will attach to hand brake lever to form the sandwich and hold it all in place. 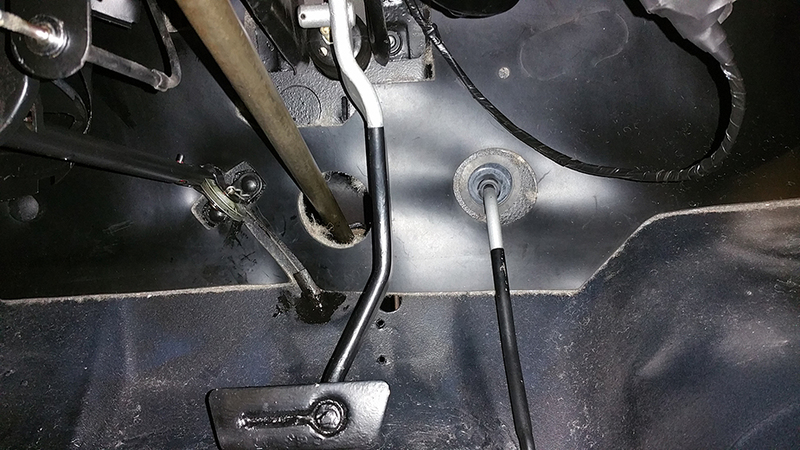 I refurbished the hand brake lever previously and for the quick link click here. With the rubber for the hand brake in place I applied a small bead around the hole to make sure water proof and draught proof. All in place and took a while, yet nobody will see it. The final part was to fit the gas pedal grommet, this is simply slid up the inside section of the pedal and the domed part of the grommet faces into the engine bay. This entry was posted in Car, Photo's and tagged 2 speed wiper motor, bolts, emergency brake, fresh air vent, gas pedal, grommet, hand brake bracket, Mustang, Mustang Maniac, new port engineering, One man and his Mustang. Bookmark the permalink.